Mario Di Pascuale, the founder of LASIK, Cornea & Cataract Specialty Center is now celebrating his fifth year of practice in El Paso, the opening of a second location of of his practice on the east side and a new Eye C Optical boutique. 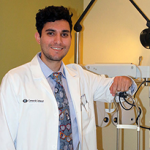 As an eye surgeon physician, specializing in cornea and medical diseases of the eye, he provides one of the best eye care options in the area. Dr. Di Pascuale constantly thrives to acquire state of the art, new and modern eye care equipment and combine it with the best medical strategies available for every patient’s needs. Combining a wide variety of services, from routine eye exams, dry eye treatment, diabetic and glaucoma screenings treatments, to complicated surgical procedures such as cornea transplants and Boston Keratoprosthesis, which is an “artificial cornea” transplant, a life changing surgery that is usually only attempted in major University Medical Centers. He is an expert on conventional and complex cataract removal offering access to premium intraocular lens such as astigmatic intraocular lens correction “Toric IOL” and “Multifocal” lens implants. He can perform this conventionally, however offers the new LASER cataract removal surgery procedure with is 10 times more precise and effective. In addition he is highly trained on laser vision correction keratorefractive surgeries such as LASIK and PRK; along with management of complex ocular surface and anterior segment diseases.